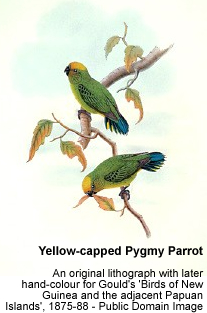 The Pygmy Parrots of the subfamily Micropsittinae all belong to the genus Micropsitta. They are native to the tropical forests of New Guinea and nearby islands.They are the smallest members of the parrot family. Pygmy Parrots are the smallest parrots in the world; followed by the Asian Hanging Parrots, the Fig Parrots (from Australia and New Guinea) and, last - but not the least - the well-known and popular African lovebirds and Australian Budgerigars. 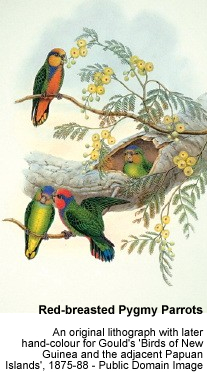 Pygmy parrots have never been successfully kept in captivity. All attempts to do so have resulted in the quick deaths of these little parrots. It is assumed that stress and dietary deficiencies are to blame. Little is known about their precise dietary needs. 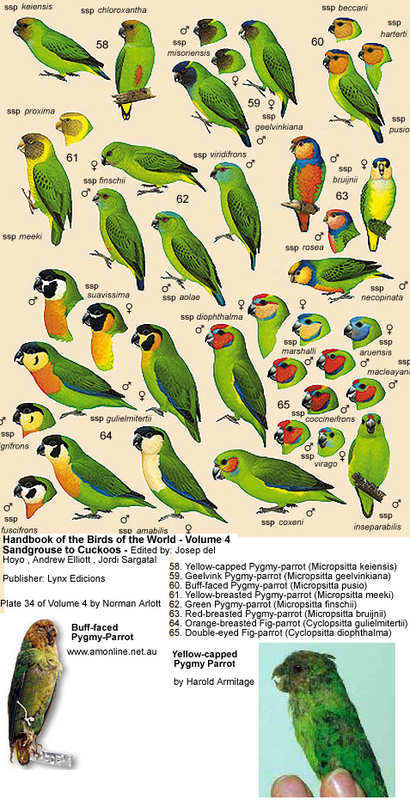 The six major sub-species are Yellow-capped, Buff-faced, Finsch's, Geelvink and the Meek's Pygmy Parrots. Oher sub-species are listed below. Pygmy parrots are tiny birds: fast-moving, mostly green with bright highlights. At a little over 3" (8 cm) in length, the Buff-faced Pygmy Parrot is considerably smaller than a silvereye or a kinglet. In fact, the Buff Faced Pygmy Parrot is the smallest Parrot in the world. They are fast-moving, mostly green with bright highlights. They spend a good deal of time climbing through foliage, using their oversized feet, beaks, and stiffened tail feathers. Their natural diet is said to consist of lichens, insects, fungi and mosses, but not much is known about their lifestyles. The Buff-faced Pygmy-parrot (Micropsitta pusio) is probably the smallest parrot of all - averaging about 8 to 10 cm (3 to 4 inches) in length and weighing around 11.5 g (0.41 oz). Males and females look alike, except the head markings are smaller in females and facial color is paler. The plumage is mostly green with a yellowish tone on the underparts. The cheeks, face, and crown are buff-colored. There is a dark blue patch on the top of the head back to the occiput. The eyes are dark brown and the bill is grey, and legs are greyish with blue or pinkish tints. Immature birds lack the blue crown (replaced with green) and they have a less distinct buff color. beccarii - occur in western New Guinea from Cenderawasih Bay to the Kumusi River. They have a darker plumage overall. The are found in the subtropical or tropical moist lowland forests in Indonesia and across the northern lowlands of the island of New Guinea from the west to the southeastern tip up to an altitude of around 800 m, as well as in the Bismarck Archipelago. They are usually seen in small groups of up to six birds and are highly active. Distribution: They are restricted to New Ireland and Bougainville in Papua New Guinea and the Solomon Islands. It has an estimated global Extent of Occurrence of 20,000-50,000 km2, and is a fairly common species of lowland forests, occurring to about 1,000 m. Although there are reports that it is poorly tolerant of logged and degraded forest (Buckingham et al. 1995, Schodde 1977) and local extirpations may have occurred (Blaber 1990), it is frequently recorded elsewhere in logged forest (B. Beehler in litt. 2000). However, the lowlands throughout the region are subject to extensive logging. The global population size has not been quantified, but it is believed to be large as the species is described as 'common' in at least parts of its range (del Hoyo et al. 1997). For these reasons, the species is evaluated as Least Concern. The Red-breasted Pygmy-parrot (Micropsitta bruijnii) is found in the boreal forests, subtropical or tropical forest areas of Indonesia, Papua New Guinea, and Solomon Islands. They occur at higher altitudes than other pygmy parrots, and use trees rather than arboreal termite nests as breeding sites. Red breasted Pygmy parrots only average 8 cm or 3 inches in length. They have jerky movements and cling close to the bark as they search for lichens growing in the trees, which form the majority of their diet.